Top 100 Best Places to Work in Indiana Ranked! 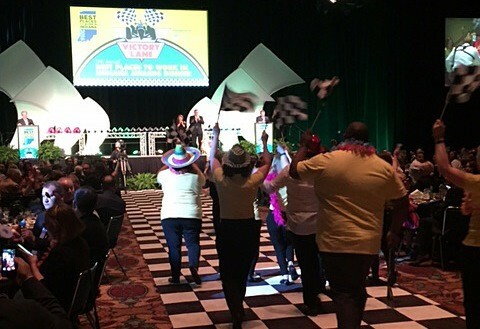 Hoosier organizations with a strong workplace environment were recognized Thursday at the Indiana Convention Center in downtown Indianapolis. Before a crowd of 1,200, the Indiana Chamber of Commerce unveiled rankings for the 100 companies that made the 2016 Best Places to Work in Indiana list (released in February). It marks the first time that Luther Consulting, Mainstreet and Katz, Sapper & Miller head their respective groups. It’s also a return for Microsoft to the top spot, where they have been a record five times. “A big congratulations to the No. 1 organizations. Their leaders and each company on this list understand how important it is for the success of a business to have a culture that respects and values employees,” states Indiana Chamber President and CEO Kevin Brinegar. Organizations on the 2016 list that have displayed sustained excellence during the program’s 11-year history received additional recognition with Best Places to Work in Indiana Hall of Fame and Pinnacle designations. Hall of Fame companies are those that have been named a Best Place to Work in Indiana at least two-thirds of the time in the program’s history; a total of 15 organizations on the 2016 list meet that criteria. Two companies – Edward Jones and Katz, Sapper & Miller – have made the Best Places to Work list all 11 years of the program. The Pinnacle designation is reserved for those that have finished first in their category three or more times in a five-year period. The four Pinnacle companies are Edward Jones (tops in the large employer category from 2006-2008); Hollingsworth & Zivitz, P.C. (first in the small employer category from 2011-2014); Microsoft (tops in the major employer category in 2013-2014 and in the large employer category in 2011-2012); and Sikich LLP (first in the large employer category from 2013-15). In addition to Hylant, Best Places to Work in Indiana is sponsored by: Moser Consulting, Inc.; University of Indianapolis; Comcast Business; Conner Insurance; Eaton; Formstack; Human Capital Concepts; Kings Island; OurHealth; Smithville Fiber; and Trilogy Health Services. The Best Places organizations were determined through employer reports and comprehensive employee surveys. The Best Companies Group, which handled the selection process, oversees similar programs in 27 other states. All companies that participated in the 2016 Best Places to Work program receive an in-depth evaluation identifying strengths and weaknesses according to their employees. In turn, this report can be used in developing or enhancing employee retention and recruitment programs. This entry was posted in Business News, Chamber News, Human Resources and tagged Best Places to Work, indiana, Katz, luther consulting, mainstreet, microsoft, sapper by Indiana Chamber of Commerce. Bookmark the permalink.